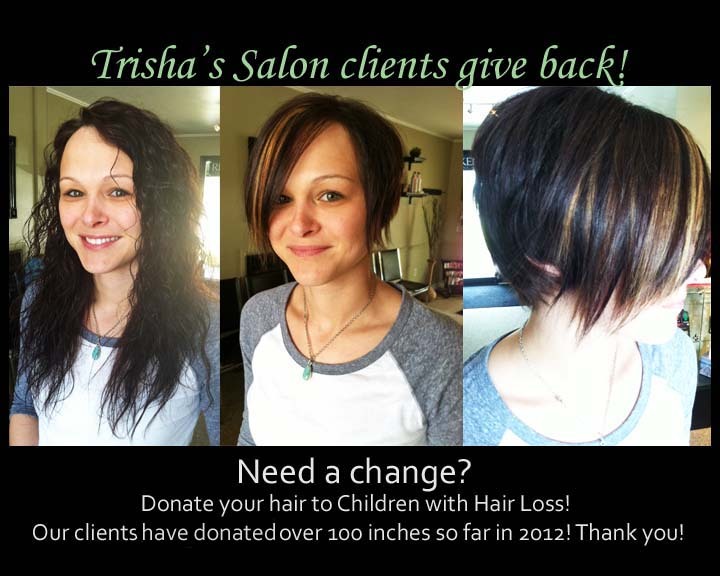 Trisha’s Salon has generous clients! Many clients have chosen to donate their long locks and make a drastic style change to help children in need! 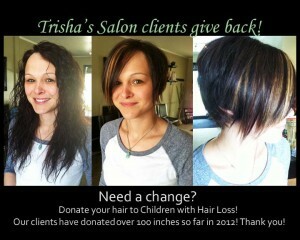 So far in 2012 clients have donated almost 100 inches of hair to Children with Hair Loss! Their organization “was created as a resource for ALL CHILDREN who have medically-related hair loss. Our goal is to assist as many of these children as possible in changing their lives by improving their outlook and empowering them with a degree of self confidence that will allow them to face the world with renewed self esteem.” Here at Trisha’s Salon we believe in supporting their goal, and are grateful to the clients that have helped us over the years! Thank you!